With bits of burger, pockets of cheese, and of course, bacon, everyone will be asking for a second or third slice. 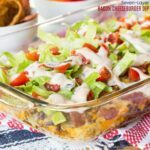 Bacon Cheeseburger Crustless Quiche recipe gives new meaning to breakfast for dinner, or even dinner for breakfast. 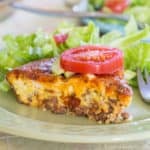 This hamburger quiche with ground beef, bacon, and cheese is satisfying and delicious when you add your favorite burger toppings. 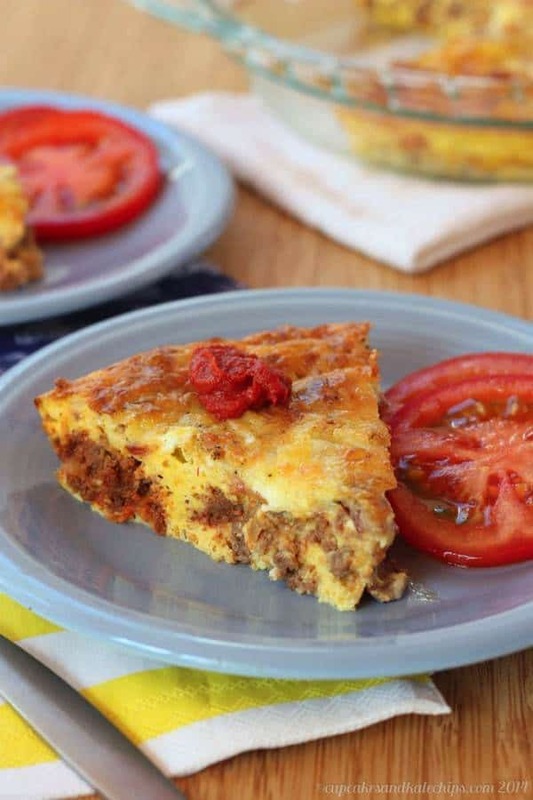 As breakfast, brunch, or my favorite, brinner, all of your favorite guys will want a slice (or three) of this gluten-free and low carb crustless bacon cheeseburger quiche recipe. 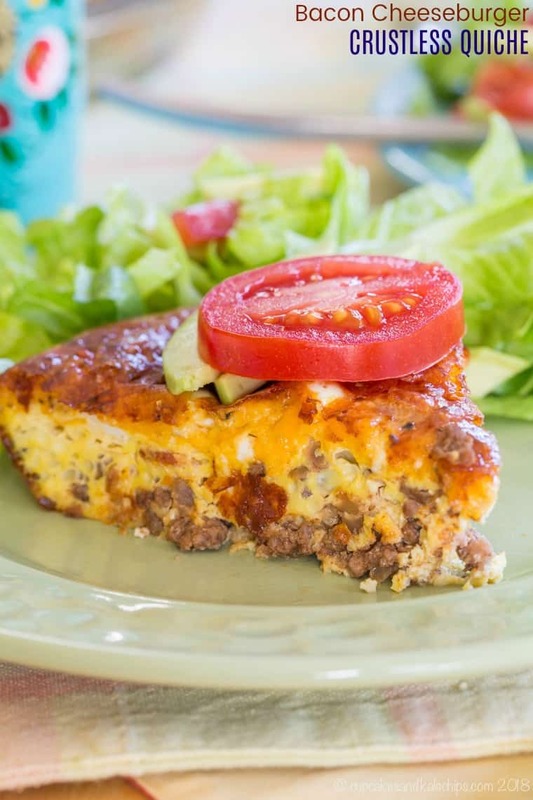 There’s no pesky crust business to get in the way of all the meaty goodness in this Bacon Cheeseburger Crustless Quiche. Of course you have eggs and gooey cheese, but when you sink your teeth into meaty bits of beefy burger and ketchup (made especially tasty when you use my bold, thick Homemade Ketchup to make this hamburger quiche recipe) and crumbled bacon, it’s has so much more flavor and texture than any quiche you’ve ever experienced before. When The Hubby and I first started dating, he was on the Atkins Diet. So yeah, man food, that was pretty much it. Beef, bacon, eggs, cheese. Heck, even low carb beer. He stuck with it for awhile, and this sugar- and bread-loving gal was supportive. Sure, our firs date was for ice cream (which later inspired this Salted Ripple Chip No-Churn Ice Cream), but he was trying to “woo” me and he knew of my addiction. Can’t blame a guy for breaking his diet once night all in the name of love. Lucky for him, it worked. But after that, when we cooked together, it was often Balsamic Marinated Flank Steak and salad or chicken and veggie kabobs on the grill. 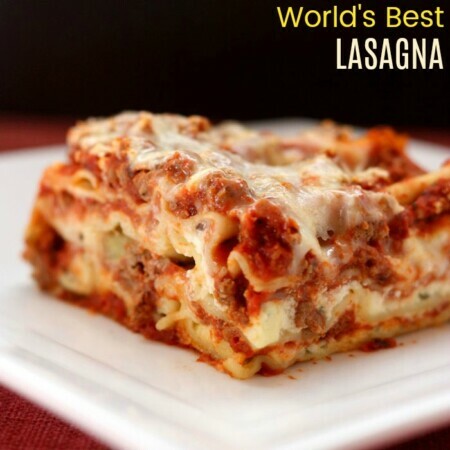 Except for the time he wanted to make me lasagna, which was good, but even he’ll admit was not the World’s Best Lasagna. Then I wanted to go to Panera and dunk a big hunk of bread in my black bean soup on pretty much a weekly basis. And, you know, it was summer. Ice cream was pretty much a necessity. And wine. There was definitely wine. 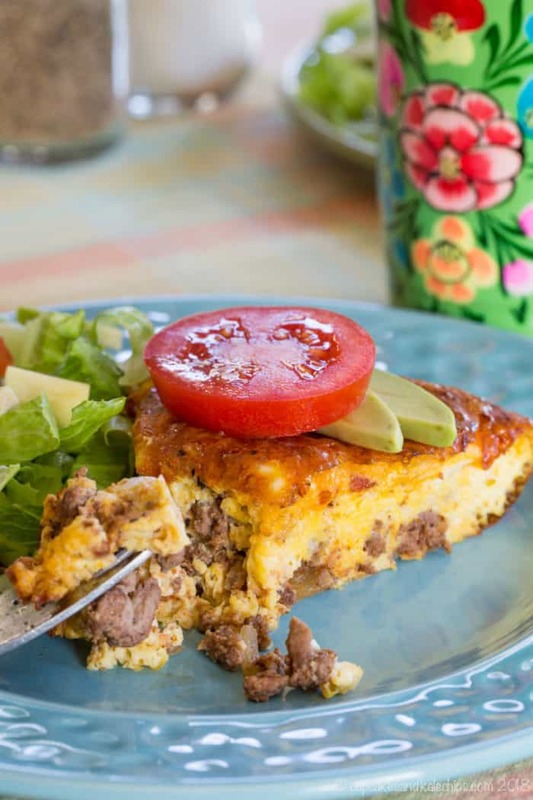 How do you make Bacon Cheeseburger Crustless Quiche? Your basic egg mixture is whisked together, with just eggs, milk, salt, pepper, and dry mustard, which is my secret ingredient in any quiche recipe or especially recipes with cheddar cheese where I just want to give that sharp cheese flavor or those eggs some pop. Cook several slices of bacon in a skillet, then set them aside while you saute onion in the remaining bacon grease. Add ground beef and cook through before stirring in some Worcestershire sauce and ketchup. 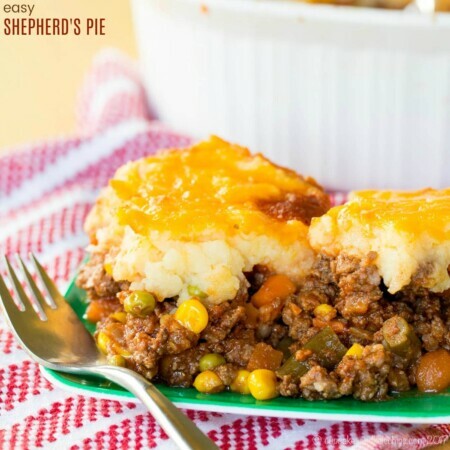 Spread the meat mixture in a glass pie plate, sprinkle with shredded cheese, then pour the egg mixture evenly over everything. Bake and serve with your favorite toppings, like lettuce, tomatoes, and avocado, or even more ketchup, like one of these 4 Variations of Homemade Ketchup. This quiche was originally part of The Bug’s birthday request for eggs and Waldorf Fruit Salad, but since then I’ve made it a bunch of times and it is always a winner! Turn your burger into cozy comfort food with Bacon Cheeseburger Soup from Shugary Sweets. Get a little messy with Slow-Cooker Bacon Cheeseburger Sloppy Joes from The Cookie Rookie. Or keep it low carb with Bacon Cheeseburger Stuffed Zucchini Boats from Sugar Free Mom. 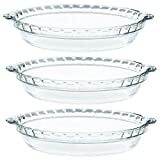 Preheat the oven to 400°F, and coat a 9-inch glass pie plate with oil or coking spray. Heat the oil or bacon grease in a skillet over medium heat. Add the onion and a pinch of salt and pepper, and saute for several minutes until soft and translucent. Add the ground beef and cook until fully browned, breaking it up as it cooks. Drain off any excess grease. Remove from the heat and stir in the ketchup and Worcestershire sauce. Transfer to the meat mixture to the prepared pie plate, and top with the bacon and shredded cheddar cheese. Whisk together the eggs, milk, salt, pepper, and dry mustard, and pour over the meat and cheese in the pie plate. Bake for 30-35 minutes, or until egg is cooked through and top is browned. Try topping this quiche with Homemade Ketchup. If you’re missing the crust, for a nice twist line the pie pan with a flour tortilla first. Thanks 🙂 I do that all the time with quiches, and if the pan is oiled you get a nice flaky crust effect. To make it fit the pan better, nuke it in a plastic bag for 10 secs or so to get it nice and flexible first. Awesome tip, Jim…. thank you! My hubby loved it. I liked it with avocado and tomato. I’m glad I checked it at 25 minutes though, because it was done. Oh good! Thanks. Yes, some ovens cook a little differently! I’m a real man who also is a great cook. This was only OK and I won’t make again. My wife agrees. We both think there are far better burger “quiche” options out there. I’m sorry you didn’t like it. It’s been one of our favorites. I don’t see where to add the bacon or dry mustard. Am I missing something? I just crumbled the bacon and added it as well as the dry mustard when I mixed in the ketchup. You are right, I missed the bacon, so I fixed it. The dry mustard is whisked into the egg mixture. Did I miss the nutrition info or is it not there? Looks great! Doesn’t say when to put the bacon in, but I will try adding it to the meat mixure at the time the ketchup and worcestershire is added. Looks awesome! I am a big fun of breakfast for dinner on occasion, and this would definitely work. Maybe with some hash browns (not atkins friendly of course, but why not?). 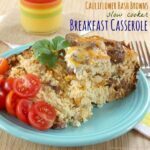 What a fabulous new recipe for our next brunch! I can’t wait to make it!! I saw this on The Country Cook Weekend Potluck and just have to pin it! Thanks!! This looks amazing! Just printed it and I reckon it’s going to become a favourite for dinner! Thanks! Same for us too! I would surly consider this manly!! My man would love it! 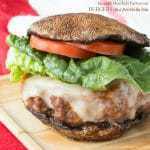 Nice spin on Bacon Cheeseburgers Brianne! 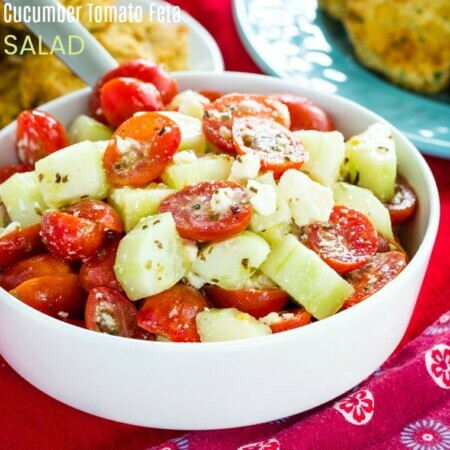 This sounds delicious and a perfect simple, summer dinner. I love that it’s crustless, kudos! Now this is how you make a quiche into man food! YUM! What funny is my husband enjoys quiche with the crust and all. I’m sure he would enjoy this one very much since cheeseburgers are on the top of his favorites list. I loved hearing more about your early courtship days with your hubs, Brianne. Smart man to woo you with ice cream, Atkins diet be damned! 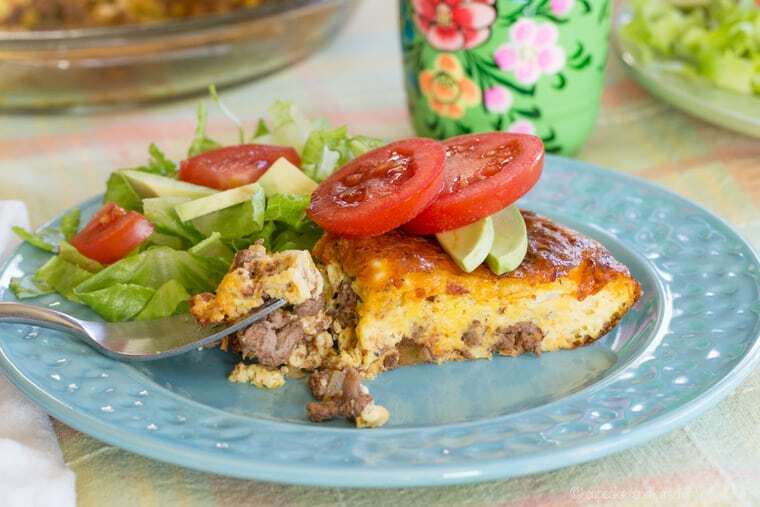 You are brilliant for stuffing cheeseburger into quiche – two of my favourite foods! I think I could finish one of these off just my myself. That means I’ll have to make two – one for me and one for my husband. I hope you guys had a great Father’s Day yesterday! 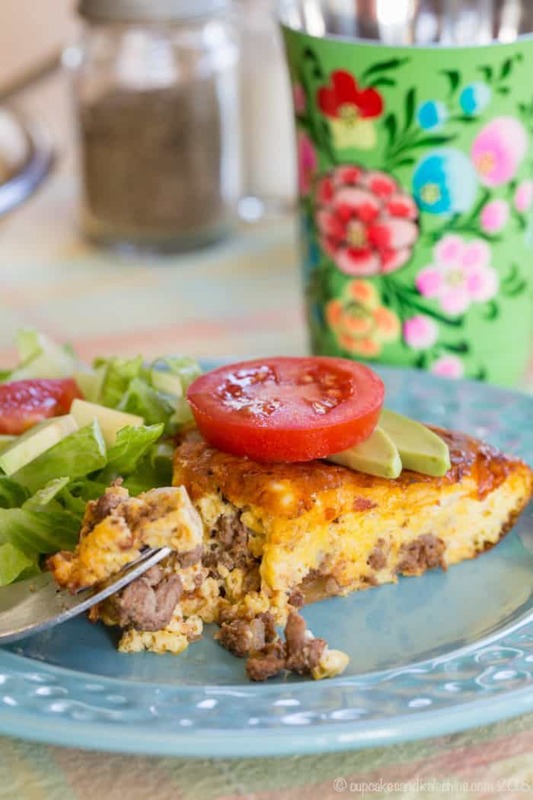 I’m so glad your version of our family favorite cheeseburger frittata has been a hit in your house! I think I am due to put this on our menu again soon! This is perfect man food! My husband would love this! I love this idea to beef up quiche. It looks fantastic! I like the idea of man quiche—great flavor combination too. Bacon is always welcomed in our home and Cory would gobble this up in a minute. Thanks for sharing! 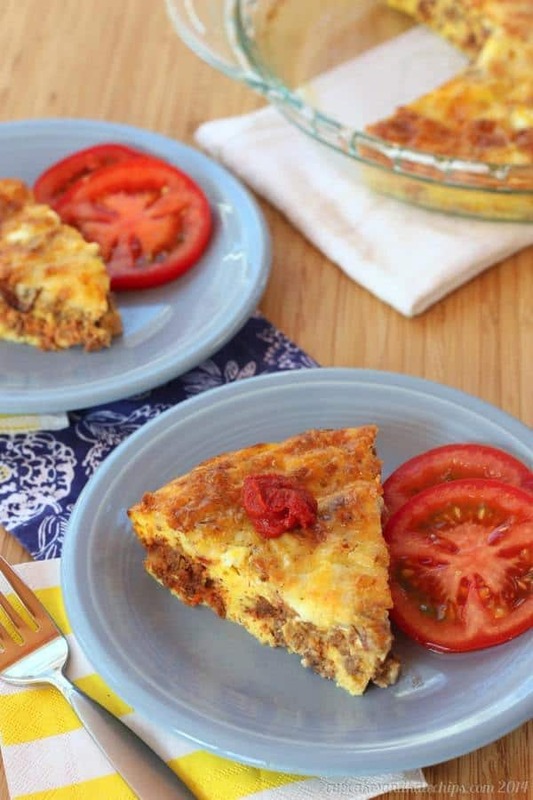 I love the idea of a bacon cheeseburger quiche! It is so unexpected but so delicious. I have to try this! It sounds and looks so yummy! I think it will be great for people on low carb diets. A man quiche indeed! My hubs is a huge fan of Atkins and is on a modified Atkins now. It really works for him, but it’s like the opposite of how I eat. I too am a #badinfluence. LOL. He would really love this. And so would the kids. I think the next time they come, I’m making this. Such a great idea. This is definitely a manly quiche if I ever saw one. I like the story you told about your first date, that’s cute he sacrificed his diet for ice cream and the chance to impress you lol. He’s a keeper! ManQuiche!! I love it! 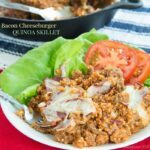 We eat a lot of low carb, so this is definitely going on the menu soon! pinned! This makes me think of the first pizza my dad ever made on his own… double bacon cheeseburger! I added onion and peppers to mine but it was such a fabulous combination. A quiche would be amazing! Real men do eat quiche especially when it is as yummy as this!! You better believe it, Tara. Thanks! This adds a whole new amped up dimension to quiche. Superbly photographed too!!! Not just eggs and veggies here! Now whoever said real men don’t eat quiche never tried your recipe. It’s on my list of things to make. Pinning for later. I love that he broke his diet for your first date, very cute. This quiche sound amazing. I have been looking for some good crustless quiche reipes as mine never turn out so I think I will try it this week. Now this is a quiche my Husband would totally eat. Me too for that matter. lol Yum! I enjoyed it just as much as my guys! 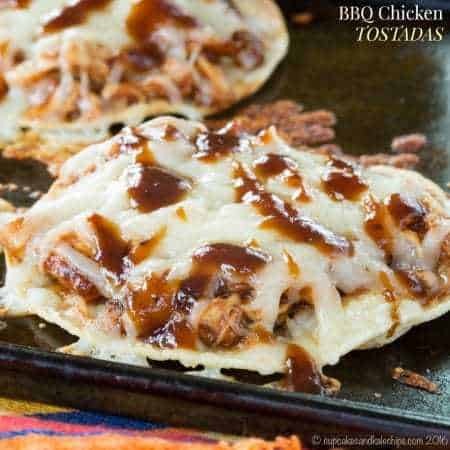 Everything about this screams “man food”– perfectly delicious! Yup, this might actually get my quiche avoiding hubby to ask for seconds! It looks terrific, Brianne! Beef and bacon always help! What a fantastic idea! It looks delicious, especially with home-made ketchup!